Gordon’s London Dry Gin or Smirnoff Vodka, Dash of Martini & Rossi Dry Vermouth and a skewer of 3 Royal Spanish Olives. (From the Official James Bond Website) Gordon’s London Dry Gin, Absolut Vodka, Kina Lillet Vermouth and Lemon Twist. Shaken, not stirred. This fast mix of Blue Curaco, Citrus Vodka, Peach Schnapps and Pineapple Juice will leave you seeing what the public saw when The '2015 Homecoming Poster, displayed in our Blue Angel Room was released! This printing blunder was distributed to countless Thousands! The first Navy Aviator to discover McGuire’s. Emory and McGuire invented this tropical drink the nite before the morning after Molly pinned Emory’s new wings on him. You get a free Emory Chenoweth Tee Shirt with this drink. Homemade Irish Eggrolls with Corned Beef, Sauerkraut and Swiss Cheese. Served with Thousand Island Dressing for dipping. A McGuire’s original. An old Irish favorite, “Boxty on the griddle, boxty in the pan; if you can’t make boxty, you’ll never get a man”. Garlic Mashed Potatoes hand rolled in Herbed Bread Crumbs and Flash Fried. Served with Salsa, Guacamole Dip and a Horse Radish Sour Cream Sauce. Hand Breaded, Golden Fried and served with Marinara Sauce and Parmesan Cheese. Tender Artichokes and Spinach blended with Select Cream Cheese, served with Tortilla Chips. A Great Combination of McGuire’s Munchies. A True Irish Country Meal. A Casserole of Ground Steak with fresh Vegetables topped with Smashed Irish Potatoes, Cheddar Cheese and Baked to a Golden Brown. (*This item is not available during Sunday Brunch.). Choice Tenderloin Tips baked with Wild Mushrooms in a strong-flavored Cabernet Wine Demi-Glaze and topped with a Homemade Puff Pastry Crust, served with a Garnish of Roasted Carrots. (*This item is not available during Sunday Brunch.). A true Irish Style Stew made from Braised Grade A Lamb Shanks, Onions, Irish Potatoes, Parsnips, Turnips, Carrots and Celery. (*This item is not available during Sunday Brunch.). Our Brewer's Choice of Sausages from Around the World, Sauerkraut, German Potato Salad, and a Free McGuire's Craft Brewed Ale. Kosher Pork Ribs that have Smoked all night in our Hickory Smokehouse with a Honey BBQ Glaze. Served with Potato Salad and McGuire's Baked Beans. We Feature U.S.D.A. CERTIFIED PRIME Steaks, Grilled over Hickory Wood Fires. Served with Senate Bean Soup or a Salad, and Fried Irish Potatoes, Baked Potato, Garlic Mashed or Creamed Spinach. U.S.D.A. Certified Prime Aged Beef grilled over wood fires and served sizzling in Garlic Hotel Butter. Hand-cut from aged U.S.D.A. Certified Prime Beef. The most fat marbling of all the Prime Cuts, which gives it more flavor. 12 oz. Hand Cut In House from our Choice Tenderloins. Filet Mignon, a smaller 8 oz. cut Grilled over Hickory Wood Fires. Grilled to Perfection, served with Mint Jelly. with an Irish Whiskey Glaze. This is Certified Angus Beef, But it is NOT McGuire's Prime. Strong Onion Reduction Broth loaded with chopped sautéed Onions, topped with Toasted French Bread and covered with Oven Browned Swiss Cheese. with Crisp Lettuce, Red Onions, Grape Tomatoes, Red & Yellow Peppers, Cucumbers, Carrots, Pepperoncinis, Bacon, Smoked Turkey, Kosher Ham, Cheddar & Mozzarella Cheeses and a Whole Boiled Egg. Your choice served on top of a Fresh Caesar Salad. Freshly made Almond Chicken Salad Served on a Bed of Crisp Lettuce, with Granny Smith Apple Slices, Red Grapes and Garlic Parmesan Toasties on the side. -- This is Simply Delicious! Romaine Lettuce, Baby Greens, Purple Cabbage, Pickled Cucumbers, Seaweed Salad, Crisp Wonton Strips, Green Onions, Carrots and Sesame Seeds. Topped with Seared Ahi Tuna. Served with Sesame Ginger Dressing. Sliced Grilled Chicken and Applewood smoked bacon tossed with Romaine Lettuce and Caesar Dressing, wrapped in a Spinach Tortilla. Served with Homemade Potato Chips. Chargrilled and Lightly Seasoned or Creole Blackened. Served with Cottage Cheese and Homemade Cole Slaw. 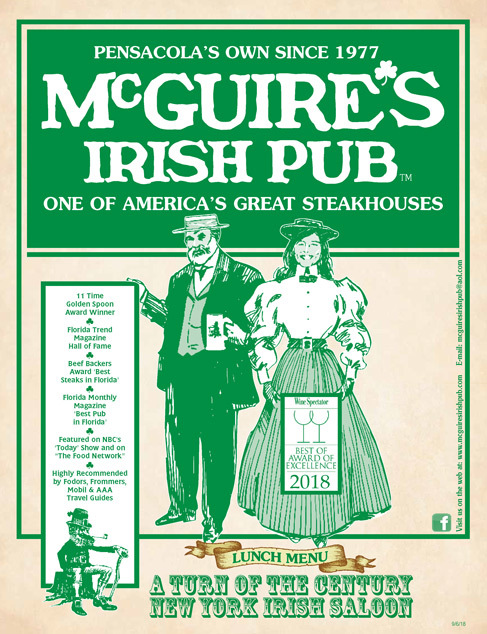 Since the Kosher Sandwich was invented in Ireland by McGuire's Cousin Nathan, it is logical that McGuire's serves the finest Kosher Sandwiches of our time. 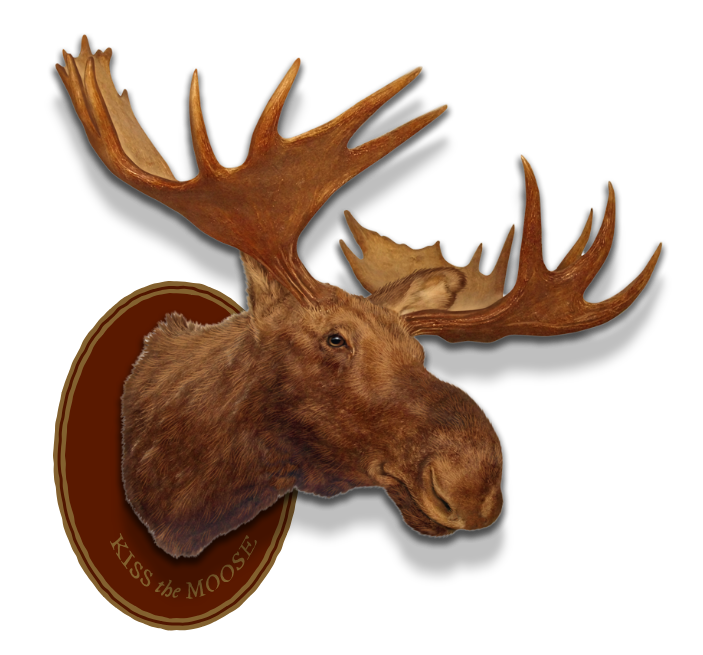 Choice of Kosher Rye, French, or our Old Fashioned Toasted Kaiser Bun. Extra Thin Sliced Hebrew National, the world’s finest Corned Beef (imported from the Bronx), with Homemade Chips and Potato Salad. The finest Pastrami available - Hebrew National on Kosher Rye Bread with Homemade Low Cholesterol Potato Chips and McGuire's Potato Salad. Our special combination of Corned Beef and Pastrami with melted Deli White Cheese on Kosher Rye Bread with Homemade Chips and Potato Salad. Ale Battered and Flash Fried on French Bread with Homemade Chips. Flash Fried on French Bread with Homemade Chips. Lean Beef Roasted Daily in our ovens with Au Jus Dip, served with Homemade Low Cholesterol Potato Chips. Same Steak as served at Pat's in South Philly with Lots of Cheese Wiz! Roast Beef piled high with Cream Cheese and Chives, Served Cold on Kosher Rye. Served with Potato Salad and Our Homemade Chips. Honey Glazed Ham piled high with Swiss Cheese, Served Cold on Kosher Rye. Served with Potato Salad and Our Homemade Chips. Charbroiled Free Range Chicken Breast with Kosher Smoked Ham and Melted Swiss Cheese on French Bread. Served with Irish Fries. A Full Pound with plenty of Onions, served on Kosher Rye Bread with a FREE McGuire's Old Fashioned Ale. A Great Traditional Pub Lunch. Served with Homemade Low Cholesterol Potato Chips.